Clergy Confidential: In Good Faith: So Long Sunday Morning? In Good Faith: So Long Sunday Morning? In my latest In Good Faith column, I explore the demise of the sanctity of Sunday morning. Does it really matter? As long as we find time to gather for worship at SOME point during the week, perhaps not. spend time on athletic fields. 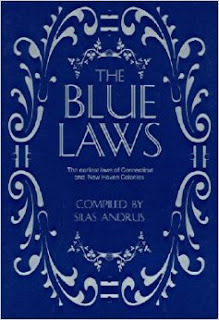 The only “blue laws” left out there are the ones governing whether it’s appropriate to use blue tooth technology in the library. This isn’t necessarily a reflection that the “moral fiber of the nation” is on the decline. Our country’s blue laws, restricting work, recreation, and the purchase of alcohol on Sundays in order to encourage religious observance, may have started in New England but they have always been a source of church-state conflict. In the nearly six and a half years since I’ve lived on the South Shore of Boston, however, the prevalence of Sunday morning youth sports has exploded. Combined with the ability to shop seven days a week either online or in person -- all of which would make even the most tolerant Puritan blush -- there’s literally no escape from daily obligation and responsibility. This doesn’t mean people are scrapping the need for spiritual renewal, reflection, and refreshment or that the nation is heading down the path to perdition. Though it may well indicate just how over-scheduled we’ve all become — and that is a spiritual issue. Because without time set aside for sabbath keeping we end up sacrificing our souls on the altar of endless activity. All of which does put a Christian minister in a bind. Do I rail against the “devil” of Sunday morning youth sports (I mean, even the NFL waits until 1:00 pm) and condemn every business from Walmart to the local coffee shop for opening before noon? Or do I take a deep breath and offer an alternative to Sunday morning worship? The reality is that for people who work hard all week, Sunday morning may well be the one day when sleeping in is even a possibility. We all need time to recharge and renew — we spend too much time running on fumes as it is. But for those of us who embrace the modern world with all its challenges and opportunities, including Sunday mornings becoming just another day, there’s still a need to step off the hamster wheel. It’s more important than ever to take time out to pause and reflect and seek perspective. Otherwise life passes us by in a flash and we realize, often too late, that we’ve missed much of it. As counter-intuitive as it sounds, it is precisely because we’re so busy that we need to make time to worship. Not to add yet another thing to our over-burdened to-do lists, but to give meaning to everything else we do. The fact that you can now buy a six pack of Bud before noon may or may not matter to you. But taking time out to worship and give thanks for the abundant blessings of this life — even if it’s not on a Sunday morning — still matters. However or wherever you find space to spiritually recharge and renew, I encourage you to do so. You owe it to yourself. Having an alternative to Sunday worship is huge. I'm just talking from the single parent perspective - and I'm very involved in my church - but there are times that Sunday morning at church seems like "just one more thing" and another chore. And yet I keep coming back. Would not adding a Saturday evening Vigil Mass, and maybe a Sunday evening Mass help this issue? We *definitely* need to be more flexible about non-Sunday morning times! Sunday/Saturday evening make a lot of sense. It is not so simple. Yes, people enjoy having another time to worship, and early evenings are a popular choice. Several Episcopal churches in Richmond, have alternate early evening services on the weekend. One of the challenges is to integrate these two congregations together into one church family because often many of the people in the later time slot do not even see the other church members. In addition, it is challenging to find regular church members who are enthusiastic about jumping over to another service in order to get it going. It is more of a hurdle than it may seem. Good luck. Additionally, by gathering at a pre-determined time, we engage in corporate worship, and we connect with our fellow parishioners. This helps strengthen my sense of community as well as deepening my spiritual connection. No, it's not all about the coffee hour, though there is a level of connectedness there, also. It's really about being surrounded physically with a group of God's saints as we praise God together and meet at God's table together that uplifts me. I have encouraged alternate worship times/ days the 20+ years I have served as deacon and pastor. Meeting needs of parishioners should be foremost, yet it rarely seems to be about serving the needs of parishioners. No ministry can be effective without serving (and meeting) the needs of those who choose to worship.